Bennett’s proposed chemical Turing machine is one of the most important thought experiments in the study of the thermodynamics of computation. Yet the sophistication of molecular engineering required to physically construct Bennett’s hypothetical polymer substrate and enzymes has deterred experimental implementations. 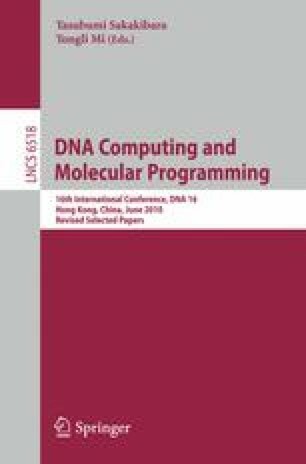 Here we propose a chemical implementation of stack machines — a Turing-universal model of computation similar to Turing machines — using DNA strand displacement cascades as the underlying chemical primitive. More specifically, the mechanism described herein is the addition and removal of monomers from the end of a DNA polymer, controlled by strand displacement logic. We capture the motivating feature of Bennett’s scheme: that physical reversibility corresponds to logically reversible computation, and arbitrarily little energy per computation step is required. Further, as a method of embedding logic control into chemical and biological systems, polymer-based chemical computation is significantly more efficient than geometry-free chemical reaction networks.